This book was great! I wished I could have read it all at once instead of bits and pieces here and there. Because it just sucked me in at once, and a few chapters in I already knew I wanted to read book 2. The book is about Princess Adele of Equatoria. She is touring her Empire and its fringes when attacked by vampires. And such awesome vampires. They are cruel and evil. They treat people like cattle, they never create anything new, they are parasites that took over everything in the North and pushed humans to the south. Those that they did not drink and kill. The mythology and creation of these horrible vampires are amazing, and that also include the new Human empires that emerged after the fall of mankind. It may be the year 2020 but Equatoria still rely on steam, but they do have airships, other than that the world has not moved forward much. I liked Adele as the heroine that is taken deep into enemy territory. She still had courage and behaved like a princess. No one could pressure her to anything. She also had depth in her. The other great character in this book is Prince Gareth, the heir to the Vampire Clan in England, but he is living alone in Scotland. He was so strange, and I wanted to know more. He asked questions and he saw that their society could not live on. And of course I, loving HEAs and such, wanted these two together. She with someone whose people see humans as cattle, and him with someone whose people wants death to all vampires. Yes, as you can see, it's totally and utterly doomed. But a girl can hope. This book was thrilling, it kept me turning page after page, hoping, wishing and fearing. There is no turning back. There can only be one winner and the vampires are truly evil so it should not be them. There is adventure, and a haunting Europe, a bloody Europe. A bloody good book. If I have to say something negative, oh I can't say it, cos it might just be a spoiler. So sorry there. I want more, I need more. Another book is coming out this spring, but I really want to read it now. I was enchanted by this world, even if it made me sad. I highly recommend this book to everyone. I loved this one and I can't wait for the second!! It was a really different sort of vampire book. Still had the romance but they were creepy too. Excellent review, B :) I've had the Greyfriar on my wishlist for awhile. I think I need to buy a copy soon. It does sound good, although I am not a big fan of steam punk. I have this on my wishlist! I have been hearing great things about the book! Tori really liked this one too! I still need to read it. Wow, it sounds like you loved it! Believe it or not but I liked it too, I liked it very much! Good to know you loved it, but this one is not for me. when you want and need more than you have my attention for sure. This sounds like a great series! A bloody good book. Perfect. Oh I've been wanting this one for a while now. I really need to get it. I thought the book was enjoyable enough but I didn't love it. I don't really remember much about it anymore but I do remember wishing that the Greyfriar's identity had been kept secret for longer to increase the mystery and suspense. I felt the store really lost it's edge by giving that up so early on. I love a good page turner! Looks like another great read. If they did get together it would be a great forbidden romance thats for sure. I've been wondering about steampunk. I haven't read any and I'm really not quite sure about them. This book sounds like a good one to start with though. yahooooooo! for steampunk. i've heard of this one and have been meaning to pick it up. glad it's a good one. Oh wow! I have this one on my WANT list as well. It sounds amazing. And I'm so glad to hear you enjoyed it so. :) Sounds like one of those books to read in a lump sum of a weekend for me. ;) Thank you!!! sounds like this one was really good!! I've heard nothing but great things about this book, and now your review adds to that. I hope you get to read the next book soon! They were so creepy! I would have run screaming at once, and then died. But then vampires should be monsters. it was amazing, I truly want book 2 now!!!! I sure hope you get it, and love it, because it was just, so good! Lol - no need to wonder if you liked this one. I'm glad it was such a great read for you! I enjoy a good vampire book but I am unsure bout this. I'm glad you enjoyed this one. I've been waiting to pick it up this summer, I'm really excited about it. 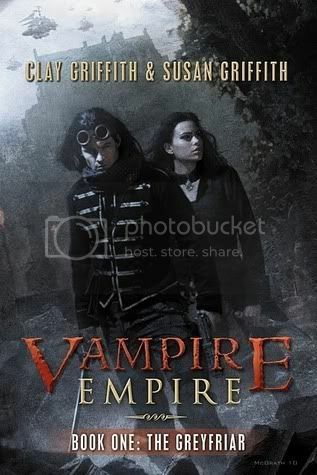 Steampunk and vampires - winning combination!